I'm planning a (mostly Western) European trip starting in London and ending in Rome, and am considering the possibility of renting a car for the entire trip. The countries I'll be entering are the UK, Ireland, France, Belgium, Netherlands, Germany, Czech Republic, Austria, potentially a day trip to Slovakia, Liechtenstein, Switzerland, Monaco and Italy. The trip is for November 2019 - February 2020. What I'm not sure about is whether this is a feasible, or even good, idea. I've seen some rental companies state that while you can take a car on a ferry (eg. from Scotland to Northern Ireland, and Ireland to Wales), their insurance won't cover any damage while doing so. Picking up a car in a non-winter-tyre country might mean it's difficult to ensure I'm complying with regulations in every country I'm passing through. My main priority is keeping things simple and having flexibility: being able to take day trips/drive to country areas; not having to lug luggage between trains, etc. I don't mind paying extra for the privilege, but don't want to break laws or get myself into difficulty. My question is: is this a feasible plan, and if so, what aspects am I missing in the things I need to plan for? Alternatively, is it worth splitting into multiple rentals (eg. UK & Ireland rental; train from London to Paris; Paris - Rome rental) to simplify the process? Trying to do this as conventional rental (Hertz, Avis, Europcar, etc.) will be extremely expensive, even if you find one. It's also inconvenient to drive a car from the "wrong" side, so I would at least break it up between the UK and the rest of Europe. Unless you are planning to drive every single day, you may be better off with a combination of flights, trains, ride share, local public transit, and short term rentals. In most larger cities, having a car is actually a headache since traffic tends to be bad and parking is sparse and expensive. Short term rentals can be conventional and "car sharing": For example in Germany there are services like https://www.car2go.com/DE/en/ (not intended as endorsement), where you can simply pick up a car nearby and drop it at your destination (in the same town). Trains and flights are good for larger distance (my wife and daughter just flew from Berlin to Rome for $17,- each). Once in you are a larger city you can rent a car to drive around locally and explore the surroundings. Local rentals also ensure that you have the right equipment and configuration at a reasonable price. Typically, there is little trouble in taking a rental car through all the countries you listed - I have done more than half of them in the same rental car already. It becomes only difficult if you would want to go further east, like Bulgaria or Poland, as most car rental companies don't allow that. Your main issue will be cost for the one-way (an arm and a leg, for sure), and to find a company that accepts international one-ways. Consider that the company has to get the car back to the original country, so they have to pay someone to fly to your destination, and drive the car all the way back. It's worth a try, but you would save thousands by making it a complete loop - for example, fly to France, rent, drive directly to GB, and then start your trip. At the end, add a day, and drive it back to France. You will lose a day each at the beginning and at the end, but save serious money. Note also that rental are typically not allowed over 30 days. You will have to turn the car in and take a replacement every 30 days latest. Just hire a car in Europe (pick it up and drop it off anywhere you want). It's completely commonplace to do this. You'd be one of a trillion tourists doing it this year! 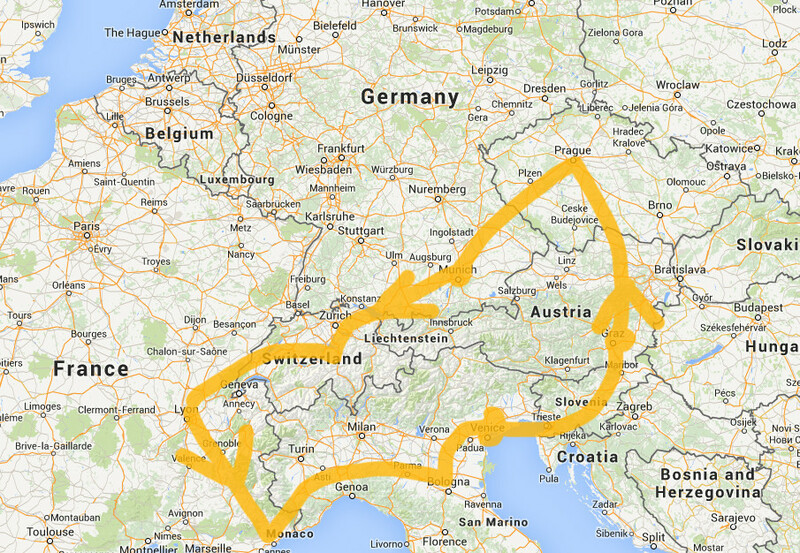 The idea of using one car for both UK/Europe is a non-starter, just forget it. As many have said, save a massive amount of money by making a loop rather than a one-way rental. One-way car rental in Europe is fantastic, but it (usually) costs a lot. Whatever you do, in the name of goodness avoid the "living hell" major airports (all London airports, Paris). Fly to Lyon or Munich or the like, and the quality of your life/holiday is boosted to a different level. One of the great joys in life is motoring around the Continent. Enjoy! Just for the record, note that it is no big deal to take a UK rental car to the Continent for, say, a day trip ... if for some reason you want to do that. I've done this a number of times in both directions. Funnily enough here's Sixt promoting the concept of a day trip! Again, you would never do this for a longer tour: simply rent a car on each landmass. Enjoy! There used to be a car hire programme called Le Swap. Suppose you are heading from the UK to France, you would return your right hand drive UK car, travel by Eurostar, and collect a left hand drive car on the other side. I cannot easily find evidence that this programme still exists but you could still try to arrange something similar. Look for rental locations at the points where you cross water. The side of the steering wheel issue won't apply between the UK mainland and the island of Ireland but the cost and complications of taking a rental car on the ferry would still apply. This strategy would certainly work if you were flying over the water but will probably work by ferry or train as well. If you really want to drive all the way then it might actually be cheaper to buy a car. Still expensive and complicated but maybe a little less less so. There have been some recent questions on this subject. There are some regulations that ban EU citizens driving non-EU rental cars in the EU. This can be awkward for hiring in Switzerland and presumably the UK shortly. You may also find insurance more expensive as a result. Not the answer you're looking for? Browse other questions tagged uk car-rentals western-europe central-europe or ask your own question. Can I rent a car in Sevilla and drive to Portugal?